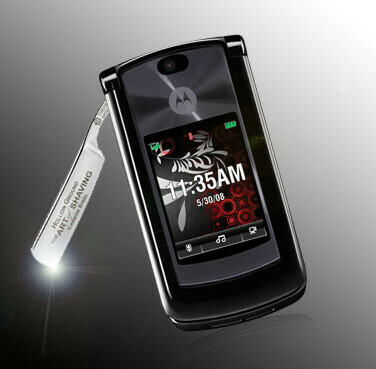 Motorola RAZR with an actual razor coming to all carriers? We have acquired some solid information, going Motorola is about to release a new model from the RAZR series, which will combine the two things a man needs the most - a cell phone and a razor. There isn't any word on the specs yet, but we are being told that Motorola wants to keep the legendary design of the handset intact, while loading it with Android 2.1 and MOTOBLUR interface. Our source claims that the package will include a shaving foam with the Motorola logo on it. The Motorola RAZR with an actual razor is expected to hit the streets this summer, being offered by Verizon, AT&T, Sprint and T-Mobile. I know this has to be an April fool. Too bad Motorola isn't releasing an improved version of the RAZR2, or one that has Android. I think the CDMA carriers got screwed with their version of the RAZR2. It had a slower processor and some specs were less than the GSM models. One even had Linux, but not on CDMA. Despite what people say about the RAZR series and the fact that some of the RAZRs have been phased out, I still wish they'd release one with newer software and maybe upgraded harware (ie. faster processor, 16 mill color screen, 5MP camera, slightly larger battery, Linux or Android OS). Not all RAZRs were bad. Most were sturdy and reliable. wow lame. They should do one on their favorite subject the Iphone like apple shutting down or something now that would be funny and have hidden in the article about someone named april..
like april from the ninja turtles? To bad they can't swap the razor for a swiss army knife. I'd buy one!! The razor wouldn't cut it! (get it)! APR FOOLS! again, I CAN STILL HAVE DREAMS! Actually, all joking aside, a Razr with a decent screen and a QWERTY loaded with Android would sell faster than pancakes at a lumberjack festival. Throw in some sausage links...it's on!